Dave Brandl interviewed March 2012. Been meaning to get to this one for several months, but got backlogged with other posts. 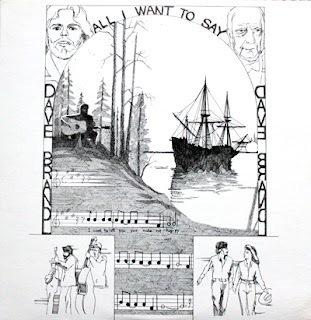 First heard of Dave Brandl's All I Want To Say (Bear Mountain VAR020 -1977) album when I was noting all of the Colorado records listed in Acid Archives. Then, I begin to see this 1977 LP pop up on auction sites, going for a nice chunk of change. So I decided to track down Dave Brandl. Alameda High School [where he was voted "Most Musical Male"]. I graduated in 1975. I went to Adams State for a year. So what did you plan to do after you left college? I was originally thinking that I would study music education, but to be honest, I just wanted to play music. How did the LP come about? I had worked with some friends and got a Teac 4-track recorder and over dubbed the tracks. I brought in a bassoon and a female vocalist. Put it together and got in touch with Steve Raydon, who helped me produce it. I picked Bear Mountain because I was going through the Yellow Pages and doing some pricing and he said he could make my record for $1.60 a piece, for a 1000 copies. Steve worked out of his garage. I think my LP was the only record the label ever did. I would take some over Colorado State University, and college friends at the time they would buy them. I also got a few in the local Peaches record stores, but it was mostly word of mouth. Did it get any airplay? Some country stations played it. I went back to Adams State and they put it on the play list college station. Tell me about the cover art. It's a representation of the different songs on the album. It was done by Joe Chirichigno. We were friends in high school, and played in some bands together. He is doing graphic design now in Florida. The back pictures on the album shows you performing. I'd play at Little Bear Mountain bars and a few solo shows, here and there. In the summers I would perform in Jackson Hole at the Jackson Lodge. Was there ever talk of a follow-up recording? Yeah, I actually had two other albums planned. The second one was going to be called Things I Didn't Think of the First Time, and the third one was going to be called You Thought I Was Finished, Didn't You? Mostly a slap in the face of reality – it didn’t take off. I got some radio play and sold a few records, and played in a band with Steve Raydon, called Mirror and we played some shows at Herman’s Hideaway and The Pearl Street Music Hall. We were together about five or six years. We never released anything, although we did meet with A&M, and met Herb Alpert and the Commodores, and moved out to California. 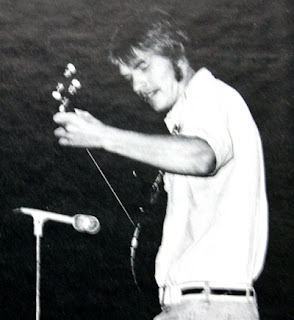 It was a period of time where I was shocked into reality of what it took to be a musician. My wife and I after did some USOs shows when we moved to California. The first The Frankie Lee Band, and we played at the Hollywood USO Club, and up and down the West Coast. Bob Hope actually opened for us. We were supposed to be the opening act for him, but it was his birthday and they wanted to get him on and off early. What have you been doing now? I'm in the computer world - programming and training. I play in our church choir in Denver. What do you think about the collectibility of your album? I find it amazing, actually. I think it’s more because it’s a collectible, not because of the content. I mean, it's often described as psych folk. I probably would now agree with that description, and I guess that's what people collect, now. I get contacted by about one or two people a year, who want to buy my album. Records by Mail, and a collector out of Seattle always call to see if I have any... I only have about 30 copies left.